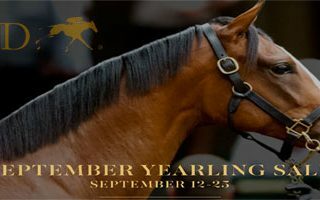 Four Star Sales / Posts tagged "Keeneland September Yearling Sale"
A War Front colt produced from the two-time grade I-winning A.P. Indy mare Love and Pride became the second seven-figure yearling Sept. 13 at the Keeneland September yearling sale when he was purchased by Shadwell Estate Co. for $1.3 million. The colt was consigned by Four Star Sales. Here is our list of yearlings which are still available for sale.